Miata folks are interested too! We of the Miata Forum would also be really interested in this! Maybe tell the folks over at the MPV club too! Even though our radios are different (see my FAQ for more info) I bet the tape connector is the same. I've already talked to OverLOAD via email, I just wanted to post to let folks know we're all together on this. Personally, I'm most interested in a simple AUX-in. A dual (with an 1/8" jack on the front and RCA in the back) would be awesome. I'm much less interested in any type of computer control. Also, our cars don't have steering wheel audio controls, so I hope that doesn't cause problems! don't worry about the face face plate, was just some nice paint work. Would be much too expensive, forget it! And as you seem to be able to read out all the digital control signals between the components, we can use the RX-8 display to show source number/name and the headunit buttons to control the AUX-module. We should make a simple solution to keeps things easy and cheap. But it should be upgradeable to fullfill everyones needs. So the key could be a modular AUX-module! If you want me to explain anything of the pictures, just let me know. Looking forward to hear your comments, friends! the TEXT button to select SOURCE NAMING / DISPLAY TYPE FUNCTION. So we have more usable buttons for optional ipod or whatever control (eg. via USB). Deffinately interested then, sounds like you've got this one kicked. I'll PM you with my personal information right away to get in line. That's the plan. The Tape-Deck Aux-IN hack that I put together basically does the same thing. So, I just want to make sure that this module goes in the cassette / MD bay and doesn't replace the stock CD / MP3 player. If optical input adds to the cost or delays time to market in any way, my vote would be to ditch it. I am, however, one of the few people here that would have use for the serial / USB connectivity for the button presses. In fact, after a bit of research, this Winamp plugin looks very useful for this exact purpose. Please tell us if there is any way to update the display text over the suggested serial interface? When you do this, are you sending some kind of pre-defined device code over the bus that the head unit accepts and displays "TAPE" or does the tape module actually send text to the display? Tobi, I looked over your suggestions, and it looks pretty interesting. It may be possible to accomplish some of what you are suggesting, but I need to get a base module out first. 1. Video. Not everyone has the NAV package. I don't and neither do most other RX-8'ers, and so goes the same with Miatas, MPVs, and Mazda6 & 3's. I don't know for sure how it hooks up, and if I can bypass it, it'll definately be a little more tricky. 2. Overriding the function of some of the button controls (like the tuner slider) may not be possible. We have to see what messages we can get from the face controls. It may be that only the messages the tape module would normally be able to recieve, are the limitations of what we can do. The potential of this will unravel soon. It's also possible that we could change the "mazda RX-8" welcome message, like some other people have suggested, but I can't say that we can, until we have, and I won't say we can't until we've tried and found no way to do it. Your schematic is somewhat close to the same 'neighbourhood' as the current design idea, but we're likyl going to have the base module come with some modular functions. It may even come with a serial port as a base module to control winamp on a PC. Since winamp already has a serial control plug-in module, this would be really easy to do, and the computer software already exists to make it work. Thanks for the contribution of the ideas. This may be possible with the unit at some point, but for now I think we'll have to forego the option of the video switcher. It may very well be possible that in the future, we could make a plug-in video module that would accomplish what you're looking for. Correct. The discussion came from two different threads, I believe... The Module will be designed to fit in the location that the stock Tape or MD units would. It will plug into the stock CD-changer, MP3 CD player, or Single CD player module. Optical is pretty easy. I'll probably go for an electrical spdif rather than a fiber-optical cable, but we'll see. It might not be that expensive. Most likely the optical connector will be avalable as a future add-in module. I've already seen and used that plug in. It's my intent to make the output from this module behave like it were a serial keypad, like this plugin uses. That means the solution to a lot of potential work that would have otherwise been more time consuming. Fortunately it falls in the real of freeware. I wouldn't be able to sell the software, or include it with the hardware, but I could point everyone to it, who might potentially want to use it. I'm interested, too. My primary goal is aux-in for the iPod (30G dock model, if that matters) so the 1/8" jack would be great. Edit: 1/16" jack?! what was I thinking? I meant std mini 1/8". duh. Last edited by jdl; 01-01-2004 at 09:09 PM. I am also interested. I have a second generation ipod that i would like to plug in, so 1/16" plug is all i need. Keep us updated on this thread. First of all: Happy New Year to all of you! Well, my idea was to keep all the stuffs - that not all guys will need - away from the base unit. But we still should keep it upgradeable to make it ready for even very high wishes. And by that way, you first can concentrate on the base unit, the add-ons can be done later. Some extra lines and connectors on the base unit for future add-on modules will not cost much more. We just have to think very good not to forget any line to use to future modules. And I really would make the serial port as an add-on. If one just wants a simple RCA input for eg. aftermarket DVD player, he cannot use it at all. In my diagram, there should be a simple logic that "sees" whether an additional input module is connected and whether it has audio/video. Regarding the video switch possibility for max. two INs, I think it doesn't hurt to have some spare lines on the circuit board to make it possible for everyone. We just have to make the switch IC possible also to distribute these signals if connected. I am not a big TFT expert, so I do not know which signals the TFT can handle, e.g. NTSC or our European PAL. Maybe the European RXs even do have different TFT input sections? And maybe one or more serial lines to control the display. E.g. to make it work even if navigation is off. Most of the control/switch stuffs could be put in the VIDEO I/O module that splits into the NAV wires. 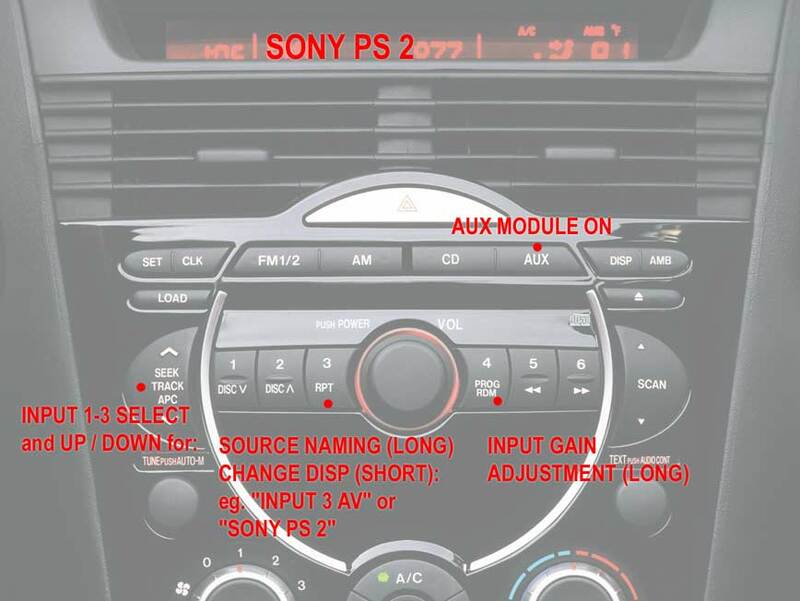 The Video switch possibility also would be very interesting for all future aftermarket DVD navigation / player users that want to feed the audio signals into the stock headunit. 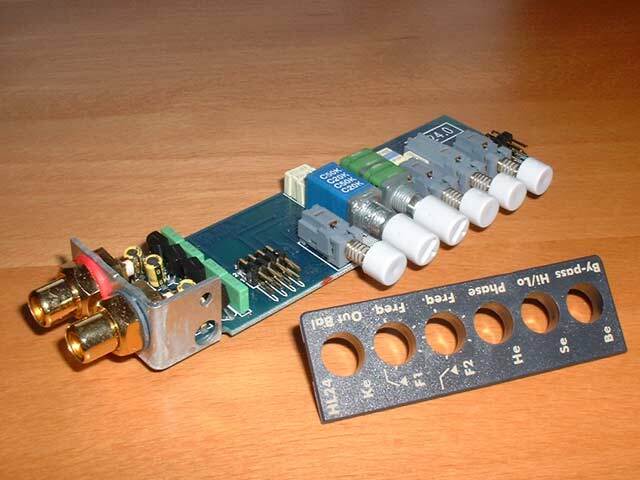 Also my car amplifier from Audison has that kinda modular layout. I like it much. You can add what you need (crossover, subsonic, equalizer, phase control ect.) but not have to buy what you will never use. This picture shows the 2-way -24dB/oct. crossover. About headunit display and buttons we will discuss when you checked what we can do and what not. Makes no big sense b4. Having video switch to display AUX on TFT would be cool. Imagine an USB controlled laptop with WINAMP on the car TFT screen! Last edited by RX-8-Tobi; 01-01-2004 at 12:03 PM. We will be making a modular unit. You will be able to add on additional functionality. What I am expecting is to add a data bus to a module slot, so that we can have intelligent modules that can do whatever we want them to do. IE. Control video, have an arbitrary number of inputs, and multiplex signals togeter. A very powerful solution, and still very cheap. The only hardware costs should be a single 10-pin header connector. Very minimal. I will detail further information about this in the future, I want to concentrate on the base unit first, and then work on feature modules. I'm adding XM and Bluetooth handsfree to my car also, so what would also be cool is sort of a 'heiracrchical' design... where if I have my iPod, XM, and Bluetooth plugged in, but if the phone rings and the bluetooth handsfree module kicks in, it overrides and mutes everthing else... so maybe a signal present on audio 1 overrides a signal on audio 2, which overrides a signal on 3? It seems as though most people want a 1/8" mini stereo plug. As I had suspected..
1 - Expansion Module Connector. This will be a bus based module connector which talks to the main chip. This will allow several additional audio sources. Possible expansion modules include SPFID Digital, or Optical, or possibly even a video switcher(Tobi). Each input will have it's own gain level control. This will work through the head unit control buttons. The will be used to fine-tune the audio levels from a source device to maximize the volume, and reduce signal loss (and noise). This is pretty minor, but critically important for the best sound quality. I know that a few people have stated that their preference is for RCA cables, and that's fine. We will provide Stereo RCA to 1/8" mini plug adapter cables for people who want them, at a small cost, or you will be able to buy your own, and use them to plug into the 1/8" mini plug. The audio format is the same, so there should be no problem with the audio source. As the new year has hit, we're getting more excited about this module, and want to get a solid working base unit ready. That will be our focus until the device ships. Then additional modules may enter development. At this early phase of the development, we have a lot of research and checking things out to do, I wish I had more answers, but I know I will soon. The heirarchical audio change over, on signal detection is something we've thought about. I'm kind of hesitant before I can promise it, since it involves making sure that the signal levels are all good when their on, and below a certain threshold when they're off. The problem is the off state. Some devices still are very noisy even when they're off. I wouldn't want the cell phone to hog the channel even when it was off. It's a possibility, and is something that we were planning on looking into along the way. I'll be sure to state what methodology we will be using as we progress. Last edited by OverLOAD; 01-02-2004 at 02:44 PM. Dear GOD Tobi... no wonder we don't have one of these already. You are trying to make a frickin commercial plugin module ^ infinity. Why dont we just start with a module that someone fools the headunit into thinking there is something in the aux or there is a tape player hooked up. We don't need all that foofoo that you want. I think 95% of the board would love something that has a left and right input jack on it and plugs/splices into the harness or HU. Wow, you are jumping into the deep end without a lifejacket on and a 100 pound weight tied to your ankles. We need to wade into this from the shallow end. On the subject of audio muting, a mute (or attenuate by x dB) function for all audio signals when a point is taken to ground (500 ohms or less to logic ground) would be helpful, as a number of cell phone car kits provide this signal. We don't need all that foofoo that you want. I think 95% of the board would love something that has a left and right input jack on it and plugs/splices into the harness or HU. I think you got me wrong. I know that most guys will be happy with just one RCA input. It was me who even wanted to leave the serial control on a separate module. I want a simple but highliy upgradeable module not for me, for all of you guys. If you do not need the extended functions, it doesn't cost much more but if you later will find out that it wouldn't be that bad to control other things, you will be able to upgrade the base module. If we NOW just make a simple base unit, we will not save much producing costs, but later, we would have to develop/buy a newer base unit when wanting to go one step further. I think the modular is the best solution for everyone. Sounds very good so far. I am happy that you will even make the level adjustment. I think RCA on the module is the better choice. It is easier and cheaper to get 1/8" to RCA adapters than RCA to 1/8" (3,5mm) adapters. RCA (Cinch) is a more common audio standard. And with Ipod ect. they will need an additinal cable anyway that comes out whereever they want to plug their device in. One thing: Where do you get the (Mazda) connector to plug the aux-module into the hu/cd player?! Pls keep us posted regarding the button/display date readout. Good idea with the handsfree muting everything, it also went into my mind. But what if we listen to CD. Will we be able to change to handsfree input even when the aux-module is not selcted?!? So we would have to force the hu to switch to the aux module. If we cannot do that (by the hu data bus), that muting function makes not much sense in my opinion. For that feature, the aux would have to be selected anytime. Last edited by RX-8-Tobi; 01-02-2004 at 03:00 AM. That occurred to me too. Muting at the HU would be the best if it can be figured out. Muting at the Aux-In module would be of less utility, but still useful if not too hard to do. Good point about handling muting for the handsfree on the HU level rather than the AUX level. The way most of them wire up is by overloading the output from the HU to the speakers themselves so that any mode is overriden by handsfree output. So I guess the idea turns more into an AUX "auto-select" based on which auxiliary device is playing at the time... this is definitely a "gravy" idea though -- not too much better than just picking which aux input you want with some kind of **** or button. I have both the CD player and the cassette player in my car. Any possibility of being able to use the add-on without removing either of them? The only functionality I really want is a single 1/8" input for my mp3 player.